The other day, I woke up to a Whatsapp message from an old secondary school friend. He was finding it very difficult to secure a job as a photographer and needed N15,000 to see his family through the rest of the month. I offered him the money but this got me thinking, especially as I had met up with another of our mutual school friend months ago in Sweden. We had scheduled a quick meeting because he was moving his family to Canada and since we were both in Europle, cheap flights meant that we could spend some time together. During the course of our conversation, we retraced our steps back and discussed how we ended up where we were, and my friends story was remarkable. Through careful research and planning, he had studied and worked in 3 countries and had received a job offer in another. He started off studying in China (for around the same amount of money it would take to study in Nigeria), then moved to Finland and then ended up in Sweden. I realised that he was no different from the guy who couldn’t support his family, as we had a similar starting point – the only difference was awareness. While luck probably played a role, his determination and awareness helped mould him into who he was. In this day and age, the decision of where to conduct your higher education could be the difference between you being a professional unemployed graduate, and you being an employer of labour. In a situation where you have little or no influence over how the government chooses to run its educational system, the most successful graduates are those who take their future into their hands – whether it is through their selection of what course to study, or where to study it. Many Nigerians are looking beyond the prohibitive costs of studying in the Us and UK, and are choosing to make the bold step of studying abroad to countries that offer free or affordable tuition. The key thing to remember is that this only works for certain people. If you’re very attached to your culture and find it difficult to change or accept the diversity in others, this probably is not for you. If you want to open yourself up to the possibility of studying abroad, you have to be willing to embracing a new culture, and learning a new language. If you are determined to study at one of the top-ranked institutions in any of these countries, a realistic, workable plan could be to spend 3 – 6 months learning the language to boost your application, before applying to a university in the country of your choice. 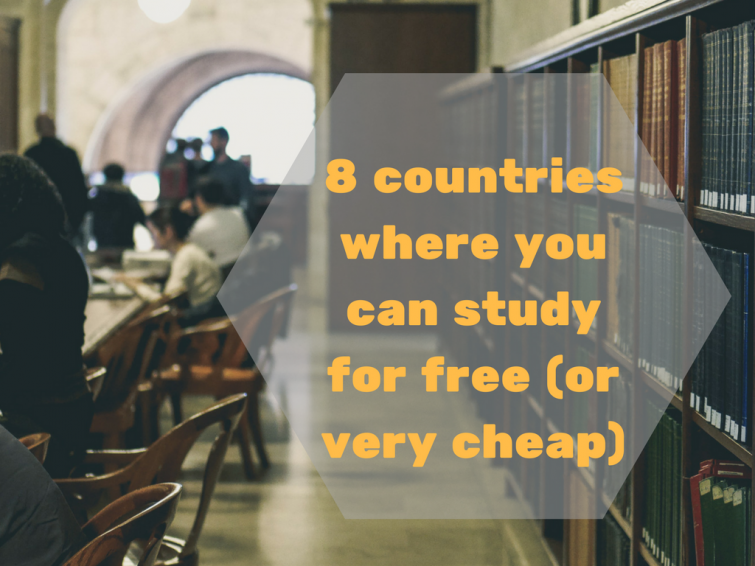 In this post, I will explore countries where you can free and low-cost options for higher education options around the world. It is free to study in Germany at all state-run public institutions, however, most institutions will ask for a small fee to cover administrative costs. There are also some degree programmes which are run in English, so you can actually earn a degree without speaking German (even though speaking German will help you tremendously). Slovenia is one of the few countries in Europe with a low cost of living as well as reputable institutions, so it might be a good idea to look into studying there. The country is close to tourist destinations such as Italy and Croatia, and university tuition is free. Like Germany, many Slovenian universities offer numerous programs of study in English, so students only need to learn the language to communicate with the locals. Home to the headquarters of the European Union, chocolate and beer, Belgium is an attractive place to study at both undergraduate and post-graduate levels. The country is a central hub for European politics and is home to more amabassadors, political leaders and journalists than most other European cities. Pursuing a degree in Belgium is also not as expensive as you may think, with costs as low as 1,000 EUR per year, depending on where you study. While tuition is free for all international students, it is important to note that the cost of living is exceptionally high and it is difficult to get a job if you don’t speak Norwegian. Also, winters in Norway are exceptionally harsh even though humans beings like you and I survive it. If you are thinking of pursuing a research-based doctoral degree, you get free tuition in Sweden. However, Sweden is Norway’s younger sister and is almost as expensive, so you will need to budget for the high cost of living there. France offers an attractive combination of world class tition and low costs, with degree programmes costing as low as $1,000 per year depending on where you choose to study. In addition to this, many programs of study at both public and private universities are offered in English. The current trend in global economics makes China an excellent study option. Studying in China also opens career opportunities in the long run, as there is an ever increasing demand for representatives who can help establish business relationships with Chinese factories. While not free, studying in China costs around $3,000 per year but the low cost of living makes up the rest. Like in every country, great deals are reserved for international students who can learn Chinese and the government offers grants to top performing students who pursue their studies in Chinese.